It all began the first day we arrived back in Rio after I went home to NY and Eli traveled around Europe. Our landlord, after stealing a good portion of stuff from the apartment, then announced that he was kicking us out and that we had until the end of December to find another place. Literally every day since then, we have scoured the real estate ads and have called dozens of realtors and owners. We visited apartments listed as being furnished that were completely empty, apartments with crap scattered everywhere from the last owners that required a proof of income, and an apartment that claimed to have a great view, that actually had a view of the asphalt through a barred window. I began to think that it was harder to find a decent apartment in Rio than in Manhattan. But then we came across an apartment that had everything it promised and more: a one bedroom on two levels in a very fancy building, with a small private pool and two terraces. The obvious problem was the price. So we sat down with the owner one day, a Brazilian who lives in Europe, to try to negotiate. He brought his employee who usually shows the apartment and some random family members, which I thought was inappropriate. He told us he'd consider lowering the price if we compensated the "lost amount" with ads on our website, and asked us to send him a proposal. (This was because, he claims, that he has had people renting the apartment every day ever since he bought it and would lose money by lowering the price. This Eli and I knew to be complete BS, considering the inflated price and non-touristy neighborhood). So we sent him a proposal, and after a lot of back and forth emails, he got back to us a week after the last email we sent, saying he wasn't interested in putting ads on the site and that his only offer was the original, incredibly inflated price. It seems his greed outweighed his common and business sense. But by then, we'd already found the perfect place. I usually made Eli make all of the phone calls inquiring about apartments, since I feared that we'd get the "gringo" price otherwise. But I saw this one ad that was so tempting that I decided to just make the call, since Eli wasn't home. I was told they were showing the apartment that very night, so I threw on some jeans and off I went. Eli and our co-worker met me on the way, and as soon as we walked in, I knew this was it. It's a two bedroom furnished apartment, and both bedrooms and the living room have panoramic views of Sugarloaf Mountain and Guanabara Bay. There are two bathrooms, though one is the "servant's bathroom," which has a toilet and a showerhead in the ceiling. There's also a storage room that I believe was originally the servant's quarters. Creepy. Anyway, we decided to get right on with the negotiations, since January is the worst possible time to try to find a place and we were running out of time. We went over and gave the deposit to the owner's employee, and told him we could move in on the 31st or the 1st, since we'd already paid our rent on our old apartment. But since the apartment owner is, shall we say, very concerned with money, she insisted we move in on the 27th, since she claimed there were other people interested in the apartment who would have moved in sooner, and therefore she was losing money but letting us move in later. Fine, we said. We'd pay the rent by the 27th and move in officially on the 31st, since we were desperate. She claimed this would also provide time to turn on the gas. However, when the person came to turn on the gas, he claimed something was wrong and that he'd have to come back and fix the tubing. Hence, the gas could not be turned on in time for our unofficial move in day. We reported this to the owner's employee, and later got this response: We can lend you a small can of gas to use and take R$100 off of next month's rent, or we can give you your money back and rent the apartment to somebody else. Thanks, lady. So yesterday, with enormous help from Eli's parents, we moved most of our stuff into the new place and also had cable TV, internet, and a phone line installed. Eli's parents were really excited, claiming the new place was so much nicer than the old one. The whole move was a family affair, and Eli's sister and aunt came too, and all of Eli's stuff was put away nicely and neatly by none other than...you guessed it, his mom. We were so exhausted from the party we threw the night before that it was a pretty miserable move, but it got done. In the meantime, we have to clean the apartment and take the rest of our stuff over to the new apartment (thankfully, just three blocks away) before we give our keys back. It's our last night here and I'm trying really hard not to think about it. Even though there are things I don't like about this place, I've grown to love it with every fiber of my being. I've come to overlook the four flights of stairs we have to walk up every day, the gas box we have to light to get hot water in the shower, the couch covered in blankets, the tiny kitchen, and the double beds we pushed together, considering everything I love about it. I love the walls, which are each painted a different shade of blue and faint green, the high ceilings, the airy bedroom, the location on a lovely street, and of course, above all, the view of Cristo from every room. I hate being kicked out, which has given me a tiny but real taste of what it's like to lose your home, which many Americans have recently. Even though we were only here for a year, we made this place our home, a little nook we carved out in this huge city. It was the first place we lived together, where we learned how to co-exist, dealing with the ups and downs of Rio and life. It wasn't just our home; it was our office, our bar, our hideaway. I fell in love with it just like I would a person, and from now on, every time I pass the building I think my heart will ache like it used to over ex-boyfriends. I loved this place so much that I convinced myself we could stay here for as long as we wanted, and maybe even buy it some day. Ha. Every day since I moved to Brazil, I've gotten a little less naive, in one way or another. So I'm going to go curl up on the couch and stare up at Cristo for one last night. I guess it's just the end of another chapter in my adventures in Rio. I have a thing about my hair. I'm not a terribly high maintenance person, and I only get my hair cut 2-3 times a year, but I am very picky about hairdressers. In fact, I can count on one hand the number of times I've had my hair cut by someone other than my home hairdresser who I've gone to since middle school back in New York: once in Santo Domingo (disaster), once in Buenos Aires (surprisingly not bad), once in Washington, DC (decent) and once in Rio. Other than that, I just wait until I'm home to get my hair done. The last time I got my hair cut here, I went to a small local salon where the woman used a razor blade to give me a trim and apparently cut my hair in the shape of the V, which I would only discover six months later. So this time, I was determined to go to a little bit nicer place. I found a very nice salon nearby, made an appointment, and off I went. As soon as the hairdresser appeared, I had an immediate, if not totally politically correct thought: "Oh thank god, it's a gay guy. 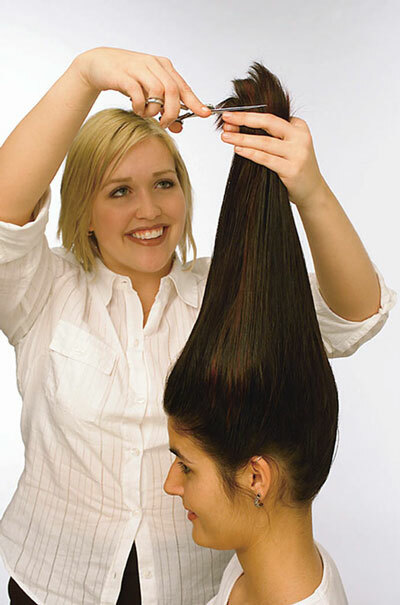 I can trust him not to completely f*ck up my hair." In the end, I was right, since he did a beautiful job in record time. He washed my hair in chocolate shampoo and "red fruit" conditioner, and they both smelled so delicious that I wanted to turn around and eat my own hair. But that's not to say there were a few scary moments. He asked if I wanted to angle my hair, and I said fine. Here's how he did it. After cutting the rest (with scissors, thank god), he brushed the front section of my hair straight into the air, like a cartoon character who just got electrocuted. (It looked a little like this, except instead of grinning I was sick with fear). He then twisted this section, placed his thumb about 2 or 3 inches from the top of the twist, and cut it all off with a single snip of the scissors. My heart fell through my stomach as he dropped the sheared hair back into my face. Once he fixed it up a little, though, I felt better. Also, when he was drying my hair, he pulled my hair so hard on the brush that there were times that I was on a 30 or 40 degree angle, since he took my entire head with him. Thankfully, I don't have to go through this again for another six months. Phew. The other night, I looked out the window and thought I was seeing things. Cristo was bright red. "Wtf?" I asked Eli. "Do you think it's a Rio de Paz protest?" He shrugged. "Dunno. It's creepy though." One of my favorite things about living in a city is discovering new places even after you've lived there for a long time. Such has my experience been in Rio. Last week, Eliseu and I were running errands in a part of Centro I'd never been to before: the Saara. I'd been on the outskirts and in surrounding areas but never really in the smack middle of it. The Saara is a huge area of vendors and stores that sell stuff for much cheaper than you'll find in the rest of the city, and many stores are housed in achingly beautiful turn of the century pastel buildings. I was wandering around trying to find a place to eat, and I stumbled across this kilo restaurant on the corner. It was the heaven of all kilo places, with not one but two huge tables chock full of delicious food, my favorite being shrimp friend in dough. I piled my plate high and didn't even stop at the meat station or the desserts, and shoveled it all away. I wish we had that place closer to our house. The other day we were at one of the local malls and I stopped dead in my tracks when I saw this sign: PRETZELS AND CINNAMON ROLLS. I zoomed to the register. "Um roll de canela, por favor," I said. (Roll being pronounced hole) They had to put it in the oven since there weren't any ready at the moment, and then the girl slathered what looked like sugary lard on top. I savored every bite. But really the best thing happened on Sunday. Eli and I were supposed to meet some friends at a club that serves feijoada, and since we hadn't eaten since lunch, we turned and left (even after waiting on the endless line) when someone announced they'd run out of food. We were in a weird area that doesn't have that many restaurants, but lo and behold, when we reached the end of the street we found a little Asian place. Which just so happens to be our new favorite place in the whole city. Though you can order both Chinese and Japanese food from a regular menu, they also have a rodizio, which is like dim sum. They have two lists: one with Chinese and Japanese dishes, and another with meat, seafood, and vegetable barbeque rodizio. You write down a number beside each item that you want to let them know how many you'd like. However, if you order too much food and fail to eat a dish, you get charged! It's called a "waste" charge. Boy, Americans could use that. Anyway, we ordered some of the best fried shrimp I've ever had, Chinese chicken, great sushi, miso soup, a huge temaki roll, some typical take-out Chinese dishes, and multiple shrimp dishes. " I was too full at that point, but Eli also ordered two of these weird but amazing pastries, a sugared spring roll that was filled with chocolate and bananas. Earlier, we found an item on the Chinese menu listed as "fondu de frutas." The very attentive waiter told us that it was chocolate fondue with fruit, complete with the little fire underneath. I'm not sure how Chinese that actually is, but we ordered two, and I slowly died of happiness. I'm proud to present my first book! Not really, but one of my stories did get published in it. On sale now at bookstores...probably just in the US. This past Sunday was the run-off election for mayor in Rio, and Eduardo Paes, the right-wing candidate, beat Fernando Gabeira, the left-wing candidate, by less than two percent. About twenty percent of Cariocas abstained, since Monday was a holiday for public employees and lots of people went out of town for the long weekend. Had they actually voted, it's quite possible that Gabeira would have won. I admire Gabeira for his ideals and goals (amongst them gay rights and environmental protection), but he's also just a really interesting figure. He was a leftist militant during the dictatorship in the 1970s, and he helped kidnap the US ambassador to demand a prisoner exchange from the government. He was later arrested, tortured, and sent into exile. He returned after the dictatorship and went on to become a famous author and politician, and had a daughter who has become a world-famous surfer who now lives in Hawaii. 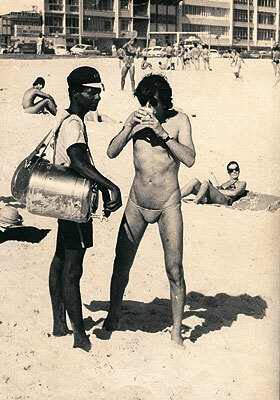 (Gabeira, meanwhile, is banned for life from the US) Despite all this, many people merely think of Gabeira as a pothead and the guy who wore a woman's bikini bottom to the beach in Ipanema back in the day. The New York Times wrote a really great article about Gabeira this week, in which the daughter of formerly kidnapped US ambassador proclaimed her love for Gabeira, even going as far as saying she would be working for Gabeira if she wasn't already working for Obama! It seems that fifty percent of Cariocas aren't ready for a change, and that some care more about a weekend at the beach than the future of their city. I just hope Americans are ready for a change. I really, really hope they are. I know I am. Eli showed me this commercial and even though I'm pretty sure it's European, it really is perfect for Americans. I can totally imagine my brother or my cousin doing this before traveling abroad.